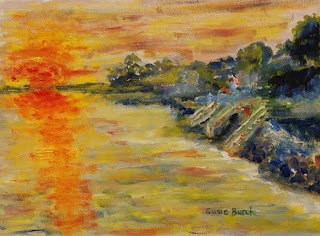 Susie Burch Art: Why people choose one piece of art work over another. Why people choose one piece of art work over another. This week, I had the honor of participating in a bi-annual art sale and exhibition sponsored by Restart Fine Art in their Four Paces Gallery in Atlanta, GA. There were 16 local artists participating with each artists presenting multiple pieces of art work. The opening night was well attended, despite the deluge of rain over the city as a result of hurricane Ida. Two additional days offered art buyers an opportunity to buy. I was very pleased to be told that I had sold two paintings when I came to pick up my contribution to the show. Above are images of the two paintings sold. It was late in the warm September day when I set up my easel on the pier at St. Simons Island, GA. I began to lay in the dark colors of the shoreline while I waited for the sunset. It was Labor Day and many people were enjoying the evening, as well. Quite a few people stopped to visit with me as I worked. This is something I always enjoy, and nothing will draw people like a working artist. However, when the sky began to turn a rainbow of colors as the sun dipped on the horizon, I had to say to everyone, "Sorry, but now I have to work, and I have to work quickly. Can't talk right now!" We were all transfixed by the sky, the reflection of the colors on the water, the rapid changes going on all around us as the shore line began to darken and disappear as day became night. Ah! There is something to be said for the magic of sunset and sea shore, together. This is what I was trying to capture in my painting. I am so glad that the buyer saw the magic, too. As for the other painting that sold, the "mood" is more somber, more patient, quieter, peaceful. 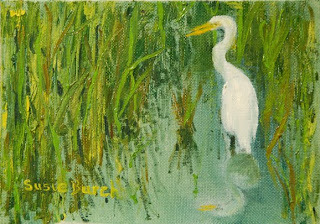 The white Egret was standing absolutely still as I spied it from my vantage point. I call this piece, "Waiting," because it was waiting, and I was waiting to see what it would do. The message I get from this scene is that if we are patient, and are willing to wait for something we desire, we will, more than likely, get it. I was told that the buyer of this painting loved it. I am so honored to know that. As an artist, I often wonder why a buyer will choose to buy a particular piece. Also, I have learned over the years, that I must never preconceive which of my pieces will sell, and which will not. A piece of art work must resonate within the soul of the buyer. The piece may remind the buyer of a location visited. Perhaps the scene is of a fantasy place that the buyer dreams of. Maybe it represents a memory from childhood. Another person may buy a piece strictly because of the color, or the shape, or for the "mood" of the painting. I paint what makes me happy. I am thrilled when someone else likes my painting enough to take it home. This is a good thing.